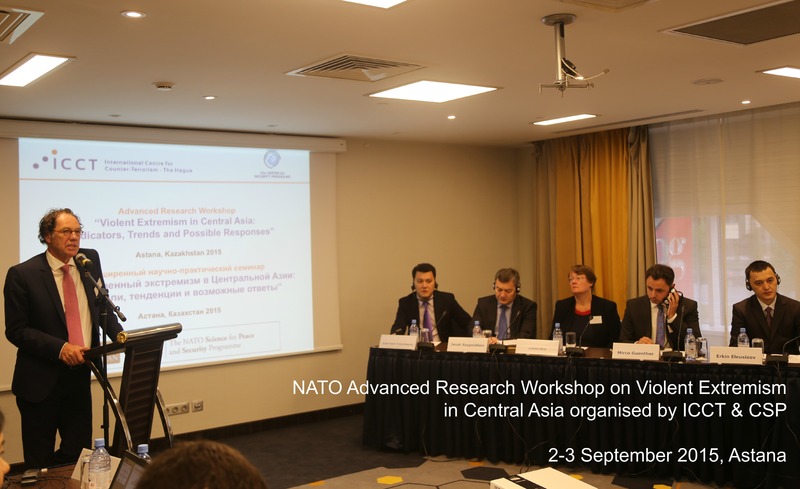 On 2 and 3 September 2015, the International Centre for Counter-Terrorism (ICCT) and the Center for Security Programs (CSP) in Astana convened a NATO Advanced Research Workshop titled ‘Violent Extremism in Central Asia: Indicators, Trends and Possible Responses’, with support of the NATO Science for Peace and Security Programme. The main aim of the workshop was to identify to what extent radicalisation and violent extremism are on the rise in the region, what can and should be done about it and how actors can advance on a countering violent extremism (CVE) agenda in the future. The two-day workshop was attended by thirty-five representatives of various Ministries of Foreign Affairs in the region, the European Union Delegation to Kazakhstan, the Centres for Strategic Studies of Kazakhstan, Uzbekistan and Tajikistan as well as academic representatives from the Kyrgyz-Russian Slavic University from Kyrgyzstan. Also present were independent researchers, directors of local non-governmental organisations and international experts and scholars. The presentations and discussions provided insights into topics such as drivers of radicalisation, counter- and deradicalisation strategies, and the government’s role in CVE.